If you like supporting indie authors and you like to buy DRM-free ebooks then chances are you're probably buying at least some of your ebooks from Smashwords, and I have some good news for you today. 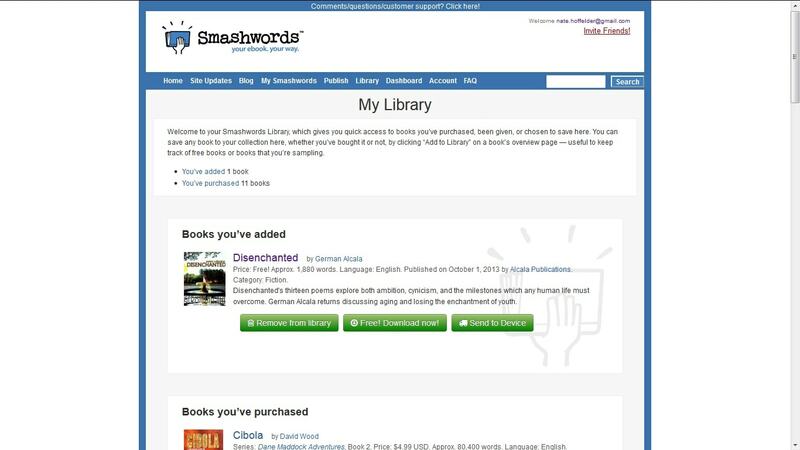 Smashwords launched a beta test yesterday. They're going to be adding a couple new features to their ebookstore which will make it easier for you to transfer your purchases to your Kindle or any device which supports a Dropbox app. According to the email I got when I was confirmed as part of the beta eDelivery only works with Epub, Mobi, and PDF; I think Smashwords is trying to avoid spamming everyone with an excess of ebooks. Smashwords will of course only be sending the Mobi file to Amazon, but they will be send all 3 formats to your Dropbox account. Or at least it is supposed to work with those 3 formats. So far the Dropbox integration doesn't seems to be working. I integrated my Dropbox account and tried to send ebooks to it from the My Library page, but they are not showing up. This is disappointing but then again it is a beta test. Things break. Smashwords was launched 5 years ago to take advantage of the new opportunities made possible by the rise of ebooks. It's grown to be the largest indie ebook distributor, and at the end of last year it carried over 190 thousand titles by nearly 60 thousand authors and publishers. That’s great but smashwords still has an extremely poor website browsing experience. You can’t filter search results very well and combine tags. Thus makes their search/browse experience horrible. The retail experience isn’t great, but, in fairness, Smashwords is primarily a distributor/aggregator. And I’d much prefer they put their time and money into making sales reporting and metadata changes from partner sites lightning fast, than to pretty up the site for the tiny percentage of the market that browses their store. i really do hope this can work. i love smashwords and i hope it is a success!